Martian dust generally connotes even finer materials than Martian soil, the fraction which is less than 30 micrometres in diameter. Disagreement over the significance of soil's definition arises due to the lack of an integrated concept of soil in the literature. The pragmatic definition "medium for plant growth" has been commonly adopted in the planetary science community but a more complex definition describes soil as "(bio)geochemically/physically altered material at the surface of a planetary body that encompasses surficial extraterrestrial telluric deposits." This definition emphasizes that soil is a body that retains information about its environmental history and that does not need the presence of life to form. Martian soil is toxic, due to relatively high concentrations of perchlorate compounds containing chlorine. Elemental chlorine was first discovered during localised investigations by Mars rover Sojourner, and has been confirmed by Spirit, Opportunity and Curiosity. The Mars Odyssey orbiter has also detected perchlorates across the surface of the planet. The potential danger to human health of the fine Martian dust has long been recognized by NASA. A 2002 study warned about the potential threat, and a study was carried out using the most common silicates found on Mars: olivine, pyroxene and feldspar. It found that the dust reacted with small amounts of water to produce highly reactive molecules that are also produced during the mining of quartz and known to produce lung disease in miners on Earth, including cancer (the study also noted that Lunar dust may be worse). MEDA, a set of atmospheric sensors that measure various things including radiation, and dust size and shape. PIXL, an X-ray fluorescence spectrometer to determine the fine scale elemental composition of Martian surface materials. This mission may also the first part of a Mars sample-return mission, collecting samples which it will leave for a potential future mission that would gather the cached samples for their transport to Earth. Any questions about dust toxicity that have not already been answered in situ, can then be tackled by labs on Earth. Comparison of Soils on Mars - Samples by Curiosity rover, Opportunity rover, Spirit rover (December 3, 2012). Mars is covered with vast expanses of sand and dust and its surface is littered with rocks and boulders. The dust is occasionally picked up in vast planet-wide dust storms. Mars dust is very fine, and enough remains suspended in the atmosphere to give the sky a reddish hue. The reddish hue is due to rusting iron minerals presumably formed a few billion years ago when Mars was warm and wet, but now that Mars is cold and dry, modern rusting may be due to a superoxide that forms on minerals exposed to ultraviolet rays in sunlight. The sand is believed to move only slowly in the Martian winds due to the very low density of the atmosphere in the present epoch. In the past, liquid water flowing in gullies and river valleys may have shaped the Martian regolith. Mars researchers are studying whether groundwater sapping is shaping the Martian regolith in the present epoch, and whether carbon dioxide hydrates exist on Mars and play a role. It is believed that large quantities of water and carbon dioxide ices remain frozen within the regolith in the equatorial parts of Mars and on its surface at higher latitudes. According to the High Energy Neutron Detector of the Mars Odyssey satellite the water content of Martian regolith is up to 5% by weight. The presence of olivine, which is an easily weatherable primary mineral, has been interpreted to mean that physical rather than chemical weathering processes currently dominate on Mars. High concentrations of ice in soils are thought to be the cause of accelerated soil creep, which forms the rounded "softened terrain" characteristic of the Martian midlatitudes. In June, 2008, the Phoenix lander returned data showing Martian soil to be slightly alkaline and containing vital nutrients such as magnesium, sodium, potassium and chloride, all of which are necessary for living organisms to grow. Scientists compared the soil near Mars' north pole to that of backyard gardens on Earth, and concluded that it could be suitable for growth of plants. However, in August, 2008, the Phoenix Lander conducted simple chemistry experiments, mixing water from Earth with Martian soil in an attempt to test its pH, and discovered traces of the salt perchlorate, while also confirming many scientists' theories that the Martian surface was considerably basic, measuring at 8.3. The presence of the perchlorate, makes Martian soil more exotic than previously believed (see Toxicity section). Further testing was necessary to eliminate the possibility of the perchlorate readings being caused by terrestrial sources, which at the time were thought could have migrated from the spacecraft either into samples or the instrumentation. However, each new lander has confirmed their presence in the soil locally and the Mars Odyssey orbiter confirmed they are spread globally across the entire surface of the planet. "Sutton Inlier" soil on Mars - target of ChemCam's laser - Curiosity rover (May 11, 2013). While our understanding of Martian soils is extremely rudimentary, their diversity may raise the question of how we might compare them with our Earth-based soils. Applying an Earth-based system is largely debatable but a simple option is to distinguish the (largely) biotic Earth from the abiotic Solar System, and include all non-Earth soils in a new World Reference Base for Soil Resources Reference Group or USDA soil taxonomy Order, which might be tentatively called Astrosols. 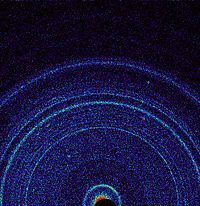 On October 17, 2012 (Curiosity rover at "Rocknest"), the first X-ray diffraction analysis of Martian soil was performed. The results revealed the presence of several minerals, including feldspar, pyroxenes and olivine, and suggested that the Martian soil in the sample was similar to the "weathered basaltic soils" of Hawaiian volcanoes. Hawaiian volcanic ash has been used as Martian regolith simulant by researchers since 1998. In December 2012, scientists working on the Mars Science Laboratory mission announced that an extensive soil analysis of Martian soil performed by the Curiosity rover showed evidence of water molecules, sulphur and chlorine, as well as hints of organic compounds. However, terrestrial contamination, as the source of the organic compounds, could not be ruled out. On September 26, 2013, NASA scientists reported the Mars Curiosity rover detected "abundant, easily accessible" water (1.5 to 3 weight percent) in soil samples at the Rocknest region of Aeolis Palus in Gale Crater. In addition, NASA reported that the Curiosity rover found two principal soil types: a fine-grained mafic type and a locally derived, coarse-grained felsic type. The mafic type, similar to other martian soils and martian dust, was associated with hydration of the amorphous phases of the soil. Also, perchlorates, the presence of which may make detection of life-related organic molecules difficult, were found at the Curiosity rover landing site (and earlier at the more polar site of the Phoenix lander) suggesting a "global distribution of these salts". 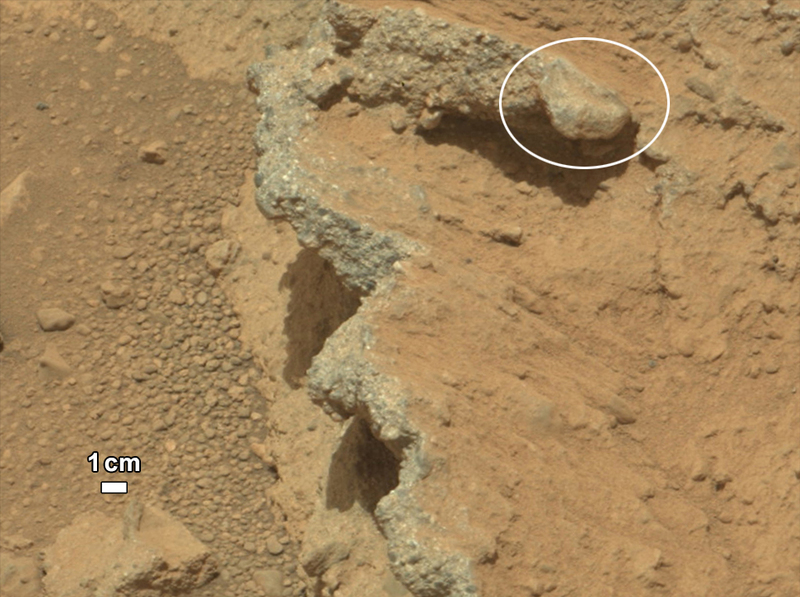 NASA also reported that Jake M rock, a rock encountered by Curiosity on the way to Glenelg, was a mugearite and very similar to terrestrial mugearite rocks. Martian Dust Devil - in Amazonis Planitia (April 10, 2001) (also) (video (02:19)). Similarly sized dust will settle from the thinner Martian atmosphere sooner than it would on Earth. For example, the dust suspended by the 2001 global dust storms on Mars only remained in the Martian atmosphere for 0.6 years, while the dust from Mt. Pinatubo took about 2 years to settle. However, under current Martian conditions, the mass movements involved are generally much smaller than on Earth. Even the 2001 global dust storms on Mars moved only the equivalent of a very thin dust layer – about 3 µm thick if deposited with uniform thickness between 58° north and south of the equator. Dust deposition at the two rover sites has proceeded at a rate of about the thickness of a grain every 100 sols. The difference in the concentration of dust in Earth's atmosphere and that of Mars stems from a key factor. On Earth, dust that leaves atmospheric suspension usually gets aggregated into larger particles through the action of soil moisture or gets suspended in oceanic waters. It helps that most of earth's surface is covered by liquid water. Neither process occurs on Mars, leaving deposited dust available for suspension back into the Martian atmosphere. In fact, the composition of Martian atmospheric dust – very similar to surface dust – as observed by the Mars Global Surveyor Thermal Emission Spectrometer, may be volumetrically dominated by composites of plagioclase feldspar and zeolite which can be mechanically derived from Martian basaltic rocks without chemical alteration. Observations of the Mars Exploration Rovers’ magnetic dust traps suggest that about 45% of the elemental iron in atmospheric dust is maximally (3+) oxidized and that nearly half exists in titanomagnetite, both consistent with mechanical derivation of dust with aqueous alteration limited to just thin films of water. Collectively, these observations support the absence of water-driven dust aggregation processes on Mars. Furthermore, wind activity dominates the surface of Mars at present, and the abundant dune fields of Mars can easily yield particles into atmospheric suspension through effects such as larger grains disaggregating fine particles through collisions. The Martian atmospheric dust particles are generally 3 µm in diameter. It is important to note that while the atmosphere of Mars is thinner, Mars also has a lower gravitational acceleration, so the size of particles that will remain in suspension cannot be estimated with atmospheric thickness alone. Electrostatic and van der Waals forces acting among fine particles introduce additional complexities to calculations. Rigorous modeling of all relevant variables suggests that 3 µm diameter particles can remain in suspension indefinitely at most wind speeds, while particles as large as 20 µm diameter can enter suspension from rest at surface wind turbulence as low as 2 ms−1 or remain in suspension at 0.8 ms−1. In July 2018, researchers reported that the largest single source of dust on the planet Mars comes from the Medusae Fossae Formation. (Curiosity rover; December 17, 2015). Research on Earth is currently limited to using Martian soil simulants, which are based on the analysis from the various Mars spacecraft. These are a terrestrial material that is used to simulate the chemical and mechanical properties of Martian regolith for research, experiments and prototype testing of activities related to Martian soil such as dust mitigation of transportation equipment, advanced life support systems and in-situ resource utilization. A number of Mars sample return missions are being planned, which would allow actual Martian soil to be returned to Earth for more advanced analysis than is possible in situ on the surface of Mars. This should allow even more accurate simulants. The first of these missions is a multi-part mission beginning with the Mars 2020 lander. This will collect samples over a long period. A second lander will then gather the samples and return them to Earth. Martian sand and boulders photographed by NASA's Mars Exploration Rover Spirit (April 13, 2006). "Hottah" rock outcrop (close-up; 3D) (September 12, 2012). "Rocknest" sand on Mars – scoffmark made by the Curiosity rover (MAHLI, October 4, 2012). "Rocknest 3" rock on Mars – as viewed by the MastCam on Curiosity (October 5, 2012). 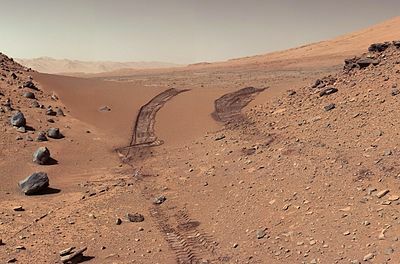 Tracks of the Curiosity rover in the sands of "Hidden Valley" (August 4, 2014). Wheel of the Curiosity rover partially submerged in sand at Hidden Valley (August 6, 2014). Sand moving on Mars – as viewed by Curiosity (January 23, 2017). ^ a b Certini, Giacomo; Ugolini, Fiorenzo C. (2013). "An updated, expanded, universal definition of soil". Geoderma. 192: 378–379. Bibcode:2013Geode.192..378C. doi:10.1016/j.geoderma.2012.07.008. ^ a b c Karunatillake, Suniti; Keller, John M.; Squyres, Steven W.; Boynton, William V.; Brückner, Johannes; Janes, Daniel M.; Gasnault, Olivier; Newsom, Horton E. (2007). "Chemical compositions at Mars landing sites subject to Mars Odyssey Gamma Ray Spectrometer constraints". Journal of Geophysical Research. 112 (E8): E08S90. Bibcode:2007JGRE..112.8S90K. doi:10.1029/2006JE002859. ^ a b "Toxic Mars: Astronauts Must Deal with Perchlorate on the Red Planet". space.com. Retrieved November 26, 2018. ^ He, H; Gao, H; Chen, G; Li, H; Lin, H; Shu, Z (May 15, 2013). "Effects of perchlorate on growth of four wetland plants and its accumulation in plant tissues". Environmental Science and Pollution Research International. 20 (10): 7301–8. doi:10.1007/s11356-013-1744-4. PMID 23673920. ^ Hecht, Jeff (March 9, 2007). "Martian dust may be hazardous to your health". New Scientist. 225 (Earth & Planetary Sciences Letters): 41. Retrieved November 30, 2018. ^ "MEPAG Goal 5: Toxic Effects of Martian Dust on Humans". Mars Exploration Program Analysis Group. NASA Jet Propulsion Laboratory. Retrieved November 30, 2018. ^ Webster, Guy (July 31, 2014). "Mars 2020 Rover's PIXL to Focus X-Rays on Tiny Targets". NASA. Retrieved July 31, 2014. ^ "Adaptive sampling for rover x-ray lithochemistry" (PDF). Archived from the original (PDF) on 8 August 2014. ^ Webster, Guy (July 31, 2014). "SHERLOC to Micro-Map Mars Minerals and Carbon Rings". NASA. Retrieved July 31, 2014. 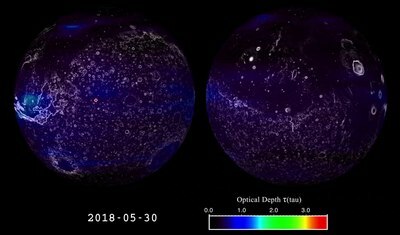 ^ "SHERLOC: Scanning Habitable Environments with Raman and Luminescence for Organics and Chemicals, an Investigation for 2020" (PDF). ^ Yen, A.S.; Kim, S.S.; Hecht, M.H. ; Frant, M.S. ; Murray, B. (2000). "Evidence that the reactivity of the Martian soil is due to superoxide ions". Science. 289 (5486): 1909–12. Bibcode:2000Sci...289.1909Y. doi:10.1126/science.289.5486.1909. PMID 10988066. ^ Mitrofanov, I. et 11 al. ; Anfimov; Kozyrev; Litvak; Sanin; Tret'Yakov; Krylov; Shvetsov; Boynton; Shinohara; Hamara; Saunders (2004). "Mineralogy at Gusev crater from the Mössbauer spectrometer on the Spirit rover". Science. 297 (5578): 78–81. Bibcode:2002Sci...297...78M. doi:10.1126/science.1073616. PMID 12040089. ^ Horneck, G. (2008). "The microbial case for Mars and its implications for human expeditions to Mars". Acta Astronautica. 63 (7–10): 1015–1024. Bibcode:2008AcAau..63.1015H. doi:10.1016/j.actaastro.2007.12.002. ^ Morris, R.V. et 16 al. ; Klingelhöfer; Bernhardt; Schröder; Rodionov; De Souza; Yen; Gellert; Evlanov; Foh; Kankeleit; Gütlich; Ming; Renz; Wdowiak; Squyres; Arvidson (2004). "Mineralogy at Gusev crater from the Mössbauer spectrometer on the Spirit rover". Science. 305 (5685): 833–6. Bibcode:2004Sci...305..833M. doi:10.1126/science.1100020. PMID 15297666. ^ Certini, G; Scalenghe, R; Amundson, R (2009). "A view of extraterrestrial soils". European Journal of Soil Science. 60 (6): 1078–1092. doi:10.1111/j.1365-2389.2009.01173.x. ^ L. W. Beegle; G. H. Peters; G. S. Mungas; G. H. Bearman; J. A. Smith; R. C. Anderson (2007). Mojave Martian Simulant: A New Martian Soil Simulant (PDF). Lunar and Planetary Science XXXVIII. Retrieved April 28, 2014. ^ Satherley, Dan (December 4, 2012). "'Complex chemistry' found on Mars". 3 News. Retrieved December 4, 2012. ^ Leshin, L. A.; Cabane, M.; Coll, P.; Conrad, P. G.; Archer, P. D.; Atreya, S. K.; Brunner, A. E.; Buch, A.; Eigenbrode, J. L.; Flesch, G. J.; Franz, H. B.; Freissinet, C.; Glavin, D. P.; McAdam, A. C.; Miller, K. E.; Ming, D. W.; Morris, R. V.; Navarro-Gonzalez, R.; Niles, P. B.; Owen, T.; Pepin, R. O.; Squyres, S.; Steele, A.; Stern, J. C.; Summons, R. E.; Sumner, D. Y.; Sutter, B.; Szopa, C. (September 27, 2013). "Volatile, Isotope, and Organic Analysis of Martian Fines with the Mars Curiosity Rover". Science. 341 (6153): 1238937. Bibcode:2013Sci...341E...3L. doi:10.1126/science.1238937. PMID 24072926. ^ a b Grotzinger, John (September 26, 2013). "Introduction To Special Issue: Analysis of Surface Materials by the Curiosity Mars Rover". Science. 341 (6153): 1475. Bibcode:2013Sci...341.1475G. doi:10.1126/science.1244258. PMID 24072916. ^ a b Meslin, P.-Y. ; Forni, O.; Schroder, S.; Cousin, A.; Berger, G.; Clegg, S. M.; Lasue, J.; Maurice, S.; Sautter, V.; Le Mouelic, S.; Wiens, R. C.; Fabre, C.; Goetz, W.; Bish, D.; Mangold, N.; Ehlmann, B.; Lanza, N.; Harri, A.- M.; Anderson, R.; Rampe, E.; McConnochie, T. H.; Pinet, P.; Blaney, D.; Leveille, R.; Archer, D.; Barraclough, B.; Bender, S.; Blake, D.; Blank, J. G.; et al. (September 26, 2013). "Soil Diversity and Hydration as Observed by ChemCam at Gale Crater, Mars". Science. 341 (6153): 1238670. Bibcode:2013Sci...341E...1M. doi:10.1126/science.1238670. PMID 24072924. Retrieved September 27, 2013. ^ Stolper, E.M.; Baker, M.B. ; Newcombe, M.E. ; Schmidt, M.E. ; Treiman, A.H.; Cousin, A.; Dyar, M.D. ; Fisk, M.R. ; Gellert, R.; King, P.L. ; Leshin, L.; Maurice, S.; McLennan, S.M. ; Minitti, M.E. ; Perrett, G.; Rowland, S.; Sautter, V.; Wiens, R.C. ; MSL ScienceTeam, O.; Bridges, N.; Johnson, J. R.; Cremers, D.; Bell, J. F.; Edgar, L.; Farmer, J.; Godber, A.; Wadhwa, M.; Wellington, D.; McEwan, I.; et al. (2013). "The Petrochemistry of Jake_M: A Martian Mugearite". Science. 341 (6153): 1239463. Bibcode:2013Sci...341E...4S. doi:10.1126/science.1239463. PMID 24072927. ^ a b Good, Andrew (April 11, 2019). "Curiosity Tastes First Sample in 'Clay-Bearing Unit'". NASA. Retrieved April 12, 2019. ^ a b Cantor, B (2007). "MOC observations of the 2001 Mars planet-encircling dust storm". Icarus. 186 (1): 60–96. Bibcode:2007Icar..186...60C. doi:10.1016/j.icarus.2006.08.019. ^ a b Claudin, P; Andreotti, B (2006). "A scaling law for aeolian dunes on Mars, Venus, Earth, and for subaqueous ripples". Earth and Planetary Science Letters. 252 (1–2): 30–44. arXiv:cond-mat/0603656. Bibcode:2006E&PSL.252...30C. doi:10.1016/j.epsl.2006.09.004. ^ Sullivan, R.; Arvidson, R.; Bell, J. F.; Gellert, R.; Golombek, M.; Greeley, R.; Herkenhoff, K.; Johnson, J.; Thompson, S.; Whelley, P.; Wray, J. (2008). "Wind-driven particle mobility on Mars: Insights from Mars Exploration Rover observations at "El Dorado" and surroundings at Gusev Crater". Journal of Geophysical Research. 113 (E6): E06S07. Bibcode:2008JGRE..113.6S07S. doi:10.1029/2008JE003101. ^ Hamilton, Victoria E.; McSween, Harry Y.; Hapke, Bruce (2005). "Mineralogy of Martian atmospheric dust inferred from thermal infrared spectra of aerosols". Journal of Geophysical Research. 110 (E12): E12006. Bibcode:2005JGRE..11012006H. doi:10.1029/2005JE002501. ^ Goetz, W; Bertelsen, P; Binau, Cs; Gunnlaugsson, Hp; Hviid, Sf; Kinch, Km; Madsen, De; Madsen, Mb; Olsen, M; Gellert, R; Klingelhöfer, G; Ming, Dw; Morris, Rv; Rieder, R; Rodionov, Ds; De Souza, Pa Jr; Schröder, C; Squyres, Sw; Wdowiak, T; Yen, A (July 2005). "Indication of drier periods on Mars from the chemistry and mineralogy of atmospheric dust". Nature. 436 (7047): 62–5. Bibcode:2005Natur.436...62G. doi:10.1038/nature03807. ISSN 0028-0836. PMID 16001062. ^ Edgett, Kenneth S. (2002). "Low-albedo surfaces and eolian sediment: Mars Orbiter Camera views of western Arabia Terra craters and wind streaks". Journal of Geophysical Research. 107 (E6): 5038. Bibcode:2002JGRE..107.5038E. doi:10.1029/2001JE001587. ^ Lemmon, Mt; Wolff, Mj; Smith, Md; Clancy, Rt; Banfield, D; Landis, Ga; Ghosh, A; Smith, Ph; Spanovich, N; Whitney, B; Whelley, P; Greeley, R; Thompson, S; Bell, Jf 3Rd; Squyres, Sw (December 2004). "Atmospheric imaging results from the Mars exploration rovers: Spirit and Opportunity". Science. 306 (5702): 1753–6. Bibcode:2004Sci...306.1753L. doi:10.1126/science.1104474. ISSN 0036-8075. PMID 15576613. ^ Ojha, Lujendra; Lewis, Kevin; Karunatillake, Suniti; Schmidt, Mariek (July 20, 2018). "The Medusae Fossae Formation as the single largest source of dust on Mars". Nature Communications. 9 (2867 (2018)). Retrieved July 25, 2018. ^ "Lunar & Mars Soil Simulant". Orbitec. Retrieved April 27, 2014.